A pair of former high school basketball standouts in Westchester are going dancing after helping lead their team to an Atlantic 10 Conference championship and a berth in the NCAA Tournament. 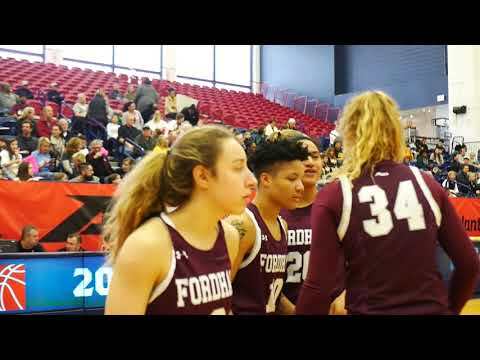 March is going to be mad for Hastings-on-Hudson resident Kaitlyn Downey and Ursuline graduate Katie McLoughlin, who both helped the Fordham University Rams defeat VCU in the A-10 title game 62-47. Bre Cavanaugh led the way for the Rams in the championship game, dropping 22 points, with Mary Goulding chipping in 19 points and four assists in the win. Both were named to the all-championship team, and Goulding was named the tournament’s Most Outstanding Player. Downey, a Maria Regina graduate who holds records for nearly every statistic at the school, finished with seven points in 37 minutes, hitting a key three-pointer late in the first half to help push the Rams to a lead they wouldn’t relinquish. She also added a career-high four steals and four assists. During her time at Maria Regina, where she was a four-year letter winner, she earned three team MVP honors, averaging 21 points, 12 rebounds, 3.8 steals and 3.6 assists in her senior year. She finished as the school’s all-time leading scorer with 1,778 points, rebounder and had the most assists in history. McLoughlin didn't see the court during Sunday's championship game, as head coach Stephanie Gaitley kept the rotation tight. While starring at Ursuline, she finished with more than 1,000 points in her career, winning two of the school's Sportswoman of the Year awards. As a freshman at Fordham, she appeared in 11 games off the bench, with a season-high of six points. The Rams will now play the waiting game, as they await the NCAA Selection Show on Monday, March 18, when they will find out who they play in the first round of their third-ever NCAA Championship berth.